Harry Potter fans awoke bright and early yesterday morning to get first dibs on the highly anticipated Harry Potter And The Cursed Child Parts I and II. At Books Kinokuniya at Ngee Ann City, undergraduates Samantha Chua, 24, and Jeremy Liu, 25, were first in line at 5am, two hours ahead of the store's opening at 7.01am. Major bookstores here, including Popular and Times, opened at 7.01am to coincide with the book's international release. It is the printed script for the play of the same name that Harry Potter creator J. K. Rowling, director John Tiffany and playwright Jack Thorne worked on together. It is also the eighth book in the Harry Potter series since the release of the supposedly final volume nine years ago. Ms Chua said: "I grew up reading Harry Potter and it's been so long since the last book that I'm really excited to find out how this new one is." By 7.01am, there were 200 in line at Kinokuniya's main branch. Many wore wizard's robes sporting their favourite house crest while others paid tribute to the main character by wearing Harry Potter's signature black-rimmed spectacles and lightning scars on their foreheads. Polytechnic student Tan Yi Min, 17, came dressed as her favourite character, Luna Lovegood, complete with a lion's head hat, as she was participating in a cosplay contest at the bookstore. She also had a shopping basket filled with Harry Potter-themed badges, folders and stickers. 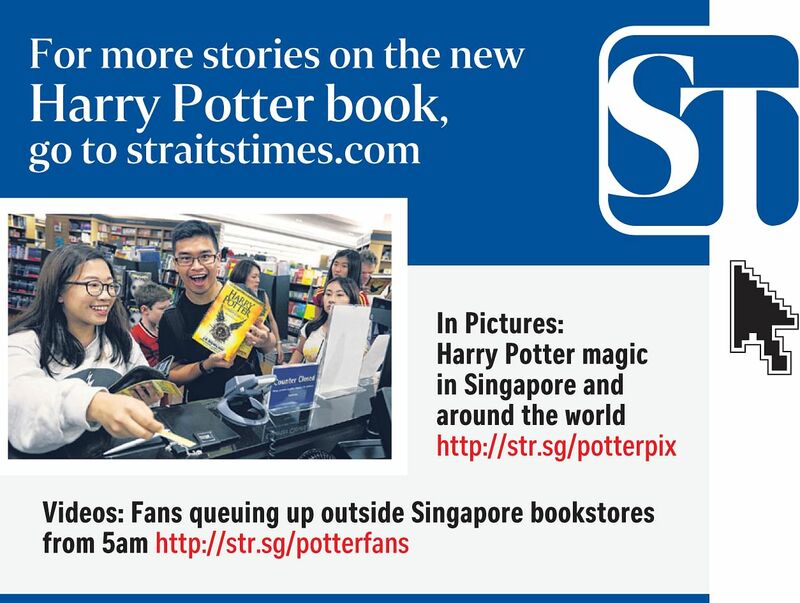 She told The Straits Times she had spent more than $2,000 on Harry Potter merchandise since becoming a fan four years ago and "couldn't believe her ears" when she heard about the new book. The story picks up 19 years after Harry Potter And The Deathly Hallows and features Potter's middle child, Albus Severus, who is uncomfortable with his family's legacy. In London, performances of the play are sold out through to next May. A Popular spokesman said that over 2,000 people hit the chain's bookstores yesterday to ring in the book's launch. All 28 of its outlets opened at 7.01am, and a private party for 120 guests was held at its Bras Basah outlet, complete with Harry Potter-themed games and snacks. Likewise, Times opened its Waterway Point outlet at 7.01am and threw a launch party with a temporary Harry Potter tattoo station. Marketing manager Melissa Foo, 38, visited Popular's Bras Basah outlet at 8am. A fan since the first book was released in 1997, Ms Foo is still on the fence about the new script book. She said: "I'm not sure how this book is going to be since it's in a different format but I'm glad that there is something new in the Potter realm." All three bookstores declined to reveal the number of copies pre-ordered and sold, but Popular sold several thousand copies yesterday while a few hundred were snapped up at Kinokuniya's main branch within the first hour. The book retails at $39.90. Yesterday, Kinokuniya offered a 20 per cent discount while Times has a 20 per cent discount on the book till Aug 31.